19/04/13 -- Soycomplex: Beans closed well off the session highs in what was probably profit-taking ahead of the weekend. Talk of corn planting delays leading to extra soybean acres for the 2013 harvest added a bit of weakness. Strong old crop demand should continue to support the nears though. As well as soybean commitments running at 99.7% of USDA targets for the season, meal sales are also at 99% which should underpin domestic crush demand going forward. Meal sales of 266,000 MT for the current marketing year reported by the USDA yesterday were impressive. Talk of Argentine farmers reluctance to sell is supportive, as they are the largest meal exporters in the world. The Buenos Aires Grains Exchange estimated the Argentine soybean crop at 48.5 MMT, unchanged from their previous estimate and said that 38.6% of the crop has been harvested versus 24% a week ago. Fund selling in beans was estimated at 3-5,000 lots on the day. May 13 Soybeans closed at USD14.28 1/4, down 2 1/4 cents; Jul 13 Soybeans closed at USD13.82 1/2, down 7 1/2 cents; May 13 Soybean Meal closed at USD412.40, up USD1.40; May 13 Soybean Oil closed at 49.16, down 50 points. For the week May 13 beans were up 15 1/4 cents, meal up USD12.20 and oil down 7 points. Corn: Corn closed higher in what was also probably a bit of consolidation and book squaring ahead of the weekend. Extremely wet and unusually cold conditions in the Midwest are seen switching some of the intended corn acreage into soybeans. "Warming in the US heartland may not be in the cards until early May," warn Martell Crop Projections. Indonesia seeks 150 TMT of optional origin corn for June shipment. Malaysia is also looking for 120 TMT of optional origin (possibly South American) corn for June shipment. The Buenos Aires Grains Exchange said that 31.7% of Argentine corn harvest is complete versus 28.2% a week ago. They estimated the crop at 25.0 MMT, unchanged from their previous estimate. The Argentine Ministry estimated the corn crop at a record 25.7 MMT and pegged harvesting at 36% complete. The Japanese Ag Ministry said that the country imported 1.16 MMT of corn in February, up 7.2% from a year ago. Only 37.6% of corn imports were from the US though, versus 88.1% a year ago. The Deutsche Bank said that the USDA is over estimating domestic US corn feed usage. Fund buying was estimated at around 5,000 lots on the day. May 13 Corn closed at USD6.52, up 7 1/2 cents; Jul 13 Corn closed at USD6.33, up 3 1/4 cents. For the week May corn was still down 6 1/2 cents though. Wheat: Wheat closed higher as another deep freeze threatens to cut US production on the Plains further. T Storm Weather said that 38% of the Kansas winter wheat crop, 10% of Oklahoma winter wheat and 29% of Texas winter wheat has the potential freeze damage. Not everybody sees it that way though. "A hard freeze occurred on the High Plains for the second straight night, temperatures falling to the low 20s F. Wheat development is behind schedule, not yet in the vulnerable flowering stage, when a hard freeze causes severe and irreversible damage," said Martell Crop Projections. Meanwhile on the northern Plains and into Canada more snow is in the forecast further delaying spring wheat planting. "North Dakota and western Minnesota wheat farms are buried beneath a thick layer of snow, not apt to melt anytime soon with a cold forecast. Likewise, Manitoba and Saskatchewan farms are frozen and snow covered, pointing to serious planting delays. In a northern climate, where the growing season is short, planting delays are especially threatening," they add. Stats Canada come out on Wednesday with their 2013 planting intentions report. May 13 CBOT Wheat closed at USD7.09, up 6 1/4 cents; May 13 KCBT Wheat closed at USD7.46, up 2 1/4 cents; May 13 MGEX Wheat closed at USD8.25 1/2, up 7 3/4 cents. CBOT wheat was still down 5 3/4 cents on the week. 19/04/13 -- EU grains spent most of the day with London wheat a little lower and Paris wheat a touch higher. The fact that in euro terms Nov 13 London feed wheat is actually dearer than Nov 13 Paris milling wheat is interesting. This could be a limiting factor for new crop prices in the UK no matter how poor current production prospects look here. London wheat closed with front month May 13 down a pound at GBP196.00/tonne and new crop Nov 13 up GBP0.15/tonne at GBP186.65/tonne. May 13 Paris wheat closed EUR0.50/tonne firmer at EUR245.50/tonne, further forward months were steadier than that. For the week that places May 13 London wheat down GBP1.75/tonne, with new crop Nov 13 down GBP0.50/tonne and May 13 Paris wheat EUR4.00/tonne lower. 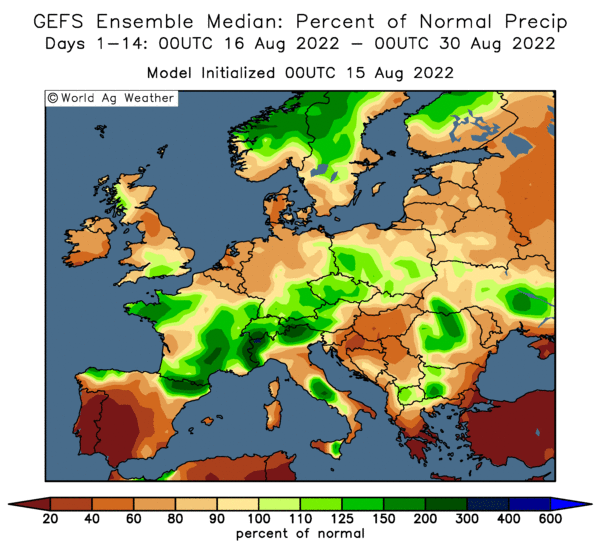 A long overdue improvement in the weather has seen the proportion of French wheat headed jump from 37% to 69% in a week, although that still remains behind the 99% headed of a year ago. Winter barley headed has advanced from 37% last week to 76% this week, but below the 100% of a year ago. Note though that a warm and early spring had crop conditions well advanced in 2012 when compared with an average year. Both the French winter grains crops are rated 65% good/excellent, the same as a week ago. In the case of wheat that is also the same as 12 months ago, and for barley it's better than the 57% of 2012. We've had three analysts release wheat production forecasts for Germany this week, with Strategie Grains estimating a crop of 23.8 MMT versus 22.4 MMT last year. The German Farm Co-op, DRV, predict a crop of 23.2 MMT, whilst Toepfer say 22.87 MMT. Whichever, they are all anticipating an increase on output in 2012. Strategie Grains also gave us an estimate of 36.2 MMT for soft wheat output in France, an increase of 800,000 MT on last year. The Spanish Ministry yesterday forecast a 31% rise in all wheat production there to 6.65 MMT, along with an increase of 15% in barley output to 6.88 MMT. Rainfall was 43% higher than normal in September-November, followed by normal winter rain, the Ministry say. 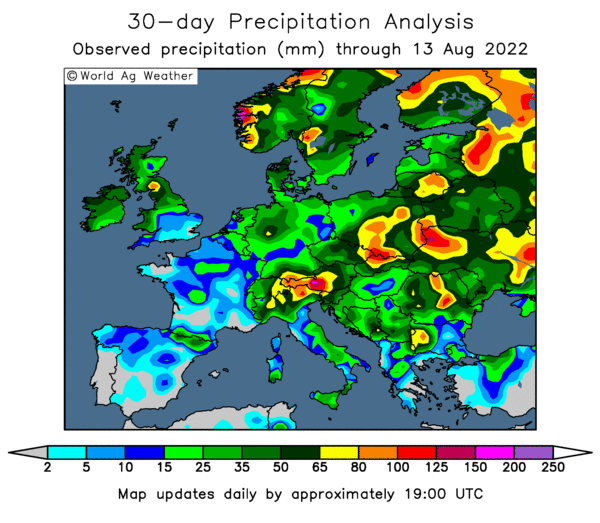 This has clearly boosted the chances of a strong harvest this year for a country that is traditionally one of Europe's (and in a normal year the UK's) largest wheat buyers. Ukraine's early spring grains planting campaign (excluding corn) is 71% complete at just over 2 million hectares, say the Ministry there. Grain exports currently stand at just under 20 MMT this season, and may rise to 24-25 MMT by the end of 2012/13, leaving carryover stocks of 5.6 MMT. In 2013 the yield of winter crops in Ukraine will increase by 15-20% compared with last year, according to the State Weather Centre. The Ukraine Ag Ministry say that 95.5% of winter grain crops in good to satisfactory condition, a huge improvement on a year ago. Rabobank yesterday forecast the Ukraine wheat crop at 22 MMT, up around 40-45% on last year depending on who's 2012 production figure you use. The Russian Ag Ministry have today increased their grain production estimate for 2013/14 from 90-92 MMT to 95 MMT. Meanwhile the general director of Russian company ProZerno today said that grain production there could rebound 38% to 98 MMT this year, allowing 2013/14 exports of 22-23 MMT. Their exports this season were only 14.15 MMT as at the end of March, and don't look likely to get above 15 MMT by the end of the season, so Russia could end up increasing foreign sales by around 50% in 2013/14 if ProZerno are correct. They estimate the Russian wheat harvest at 58.5 MMT, an increase of 55% on output in 2012. Various estimates this week for grain production in Kazakhstan this year range from "at least" 15.2 MMT to "a somewhat conservative" 16 MMT from Rabobank, or around 20-25% higher than in 2012. Essentially, the "usual suspects" of the cheap Black Sea sellers are all lining up for a sharp rebound in wheat production this year, with most of Europe looking at more modest increases in output - but increases nevertheless. Ukraine will also be an aggressive seller of corn again in 2013/14, in fact they've already begun selling that into Europe, whilst the EU-28's own corn crop was forecast 18% higher by Strategie Grains yesterday. 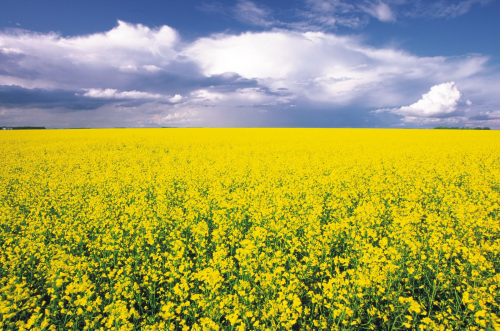 19/04/13 -- Rapemeal prices on the continent just keep on rising on seasonal tightness in availability due to plant downtime and a slump in rapeseed oil prices. 18/04/13 -- Soycomplex: Weekly export sales of 339,400 MT of old crop and 227,400 MT of new crop were in line with trade expectations of a combined 400-700 TMT. Old crop sales are now 99.7% of the USDA target for the season. The USDA also reported the sale of 252 TMT of new crop soybean sales to China. Argentine farmers are said to be reluctant sellers of new crop beans due to inflation concerns and the weak peso. MDA CropCast cut their world 2013/14 oilseeds production forecast to 457.74 MMT, down 1.85 MMT from last week due to dryness in China rapeseed areas as well as expected stress in western belt areas of the US this summer. Argentine truckers are said to be ready to strike on April 22nd. Brazilian dock workers called off a planned strike for today at the last minute. The Chinese Centre for Disease Control and Prevention said bird flu could spread between humans but that there is no reason to fear a widespread pandemic. Shanghai analysts JC Intelligence said that China’s Q2 poultry feed demand may fall 20% due to bird flu. Rabobank cut their Argentine soybean production forecast by 1 MMT to 49 MMT. They estimated the 2013 US soybean crop at 3.269 billion bushels (89 MMT), up 8.4% on last year. Yields were forecast at an average 42.5 bu/acre versus 39.6 bu/acre in 2012. Funds were estimated as net buyers of around 3-5,000 soybean contracts on the day. May 13 Soybeans closed at USD14.30 1/2, up 8 1/4 cents; Jul 13 Soybeans closed at USD13.90, up 10 cents; May 13 Soybean Meal closed at USD411.00, up USD3.70; May 13 Soybean Oil closed at 49.66, up 27 points. Corn: Weekly export sales of 400,300 MT of old crop and 16,900 MT of new crop were in line with expectations for sales of a combined 250-500 TMT. Rabobank forecast the US corn crop in 2013/14 at a record 13.941 billion bushels versus 10.782 billion in 2012/13. Yields were estimated at 157.0 bu/acre vs 123.4 bu/acre last year. They see world corn production rising 13.6% from 838 MMT in 2012/13 to 952 MMT next season, with 2013/14 world ending stocks up from 111 MMT to 145 MMT. Strategie Grains forecast EU-28 corn production potential in 2013/14 up 0.5 MMT from last month to 66.5 MMT, an increase of 18% on last year. MDA CropCast cut their preliminary 2013/14 US corn production estimate to 13.302 billion bushels, down 122 million bushels from last week "due to expected stress in western belt areas this summer." Meanwhile heavy rainfall and unseasonable cold are seen as potential pitfalls for US corn in 2013. "Serious planting delays are anticipated from very wet field conditions following strong thunderstorms and heavy rainfall this week. The morning radar shows a wave of strong showers from Missouri northeast to northern Illinois into Michigan. This band of heavy rain is moving slowly east. This rain comes on the heels of heavy rainfall last week in the eastern Midwest of 2-4 inches. Surplus soil moisture east of the Mississippi River ranged from 25-50% prior to this heavy rain. Widespread flooding is anticipated in corn fields with saturated field conditions," say Martell Crop Projections. China’s Ag Ministry said wet weather in China’s corn belt is delaying planting by up to 10 days. Funds were judges as being net sellers of around 12-13,000 corn contracts on the day. May 13 Corn closed at USD6.44 1/2, down 16 cents; Jul 13 Corn closed at USD6.29 3/4, down 11 1/2 cents. Wheat: Wheat closed around unchanged, despite robust weekly export sales, weighed down by falling corn. Export sales of 552,100 MT of old crop and new crop sales of 1.123 MMT combined gave us the largest weekly total since September 2007. The numbers included the 840,000 MT of new crop SRW wheat sold to China that had previously been reported under the daily reporting system. For old crop, sales needed each week to hit the USDA estimate were only 265,900 MT. MDA CropCast said that their estimate for 2013/14 world wheat production is 676.2 MMT, down 8.4 MMT from last week due to acreage reductions and expected dryness in the US Plains. Rabobank cut their US 2013/14 wheat crop estimate to 2.05 billion bushels versus 2.269 billion in 2012/13. Yields are forecast at 43.9 bu/acre vs 46.3 bu/acre last year. "Another hard freeze developed overnight in the Great Plains, the 3rd time in a month that temperatures fell to the mid-upper 20s F. Oklahoma is most at risk for potential freeze damage, due to the advanced stage of jointing - 78% on April 14. Preliminary indications are for some level of damage in 69% of small grains, the USDA reported. 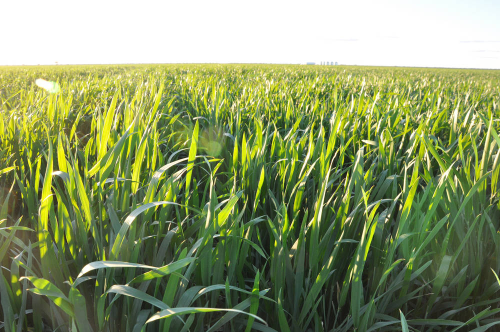 Kansas wheat jointing was only 35%, so is less susceptible to damage. Drought is a big worry in hard red winter wheat. Topsoil moisture has declined significantly in April, now 35-40% short in Kansas, Oklahoma and Texas, the top 3 wheat states," said Martell Crop Projections. Strategie Grains cut their EU-28 (including Croatia) soft wheat crop estimate to 131.1 MMT versus previous estimate of 131.6 MMT. Ag Canada estimated all wheat output there at 28.4 MMT, unchanged from their previous estimate and up from 27.205 MMT last year. Russia’s statistics office said Russia’s April 1st grain stocks were at 18.0 MMT, down 30.2% from a year ago. May 13 CBOT Wheat closed at USD7.02 3/4, down 1 cent; May 13 KCBT Wheat closed at USD7.43 3/4, up 1 3/4 cents; May 13 MGEX Wheat closed at USD8.17 3/4, up 9 1/2 cents. 18/04/13 -– The EU grains market closed mixed, on a day when outside influences took a back seat and traders weighed up an assortment of data from various private forecasters. London wheat closed with front month May 13 down GBP1.00/tonne at GBP197.00/tonne and new crop Nov 13 up GBP0.20/tonne easier at GBP186.50/tonne. May 13 Paris wheat finished EUR1.75/tonne lower at EUR245.00/tonne. The first numbers for European traders to pour over were from French analysts Strategie Grains, who cut their EU soft wheat production forecast for 2013/14 for the fourth month in succession. They lopped 0.5 MMT off last month's estimate, for what will be a 28 member trade bloc come the harvest, to give us a crop of 131.1 MMT - although that is still a rebound of 5.2% on last year. They also cut their EU-28 barley production forecast by 900 TMT to 54.2 MMT, principally due to a switch out of spring barley into corn. If they are correct then this year's barley crop in Europe will be slightly lower than last season's 54.5 MMT at 54.2 MMT. Corn production potential was raised 0.5 MMT from last month to 66.5 MMT, an increase of 18% on last year. Leading the way down for wheat output in Europe was a 330 TMT reduction for production here in the UK, adding to a similar cut of 300 TMT last month, to an average guess of 11.78 MMT from within a worst/best case spread of 10.9-12.4 MMT. That spread equates to a drop of at least 7%, and at worst a decline of 18% on last year. Some would currently suggest that "only" coming in 18% down on 2012 would be a result at this stage, even if yields were a 24 year low last year. Either way, the UK looks certain to be a major importer again in 2013/14, with domestic consumption coming in at around 13.6 MMT/year prior to the recent opening (and closing) of any bioethanol refineries. Even so, despite today's reduction in output Europe will still have around 6.5 MMT more wheat supply in 2013/14 than this season, along with an extra 10 MMT of corn and a broadly similar volume of barley, if the French numbers are correct. Elsewhere, the traditional Black Sea "pile it high and sell it cheap" brigade are looking forward to a strong recovery in wheat production in 2013. Rabobank today forecast the Ukraine wheat crop at 22 MMT, with Russia chipping in with a further 52 MMT and with a "somewhat conservative" estimate for Kazakhstan of 16 MMT. That's a combined 90 MMT of wheat versus the USDA's estimate of 63.3 MMT that these aggressive three exporters produced in 2012/13. Rabobank see world wheat production in 2013/14 up 55 MMT, or 8.6%, to 694 MMT. That increase comes despite lowering their US wheat production estimate to 2.05 billion bushels (55.8 MMT) versus 2.269 billion (61.75 MMT) in 2012/13 on the back of weather concerns. Old crop EU exports continue to run well ahead of year ago levels. Brussels today confirmed that they'd issued 392,104 MT of soft wheat export licences this week, taking the 2012/13 marketing year to date total to 16.32 MMT, up 47% on last year with 10 weeks of the season remaining. Exports may not be quite so robust in 2013/14 when the Black Sea coffers have been replenished however. Soybeans: 339.400 MT of old crop and 227,400 MT of new crop versus trade expectations of a combined 400-700 TMT. Old crop sales are now 99.7% of the USDA target for the season. Corn: 400,300 MT of old crop and 16,900 MT of new crop versus expectations of a combined 250-500 TMT. Old crop sales of around 215,300 MT/week were needed to hit the USDA export estimate of 800 million bushels. Wheat: old crop sales of 552,100 MT and new crop sales of 1.123 MMT beat trade forecasts of 200-450 TMT. The numbers included the 840,000 MT of new crop SRW wheat sold to China that had previously been reported under the daily reporting system. For old crop, sales needed each week to hit the USDA estimate were only 265,900 MT. In addition to these numbers the USDA also reported the sale of 252 TMT of new crop soybean sales to China under the daily reporting system. US wheat crop in 2013/14 at 2.05 billion bushels versus 2.269 billion in 2012/13. Yields 43.9 bu/acre vs 46.3 bu/acre last year. US corn crop in 2013/14 at a record 13.941 billion bushels versus 10.782 billion in 2012/13. Yields 157.0 bu/acre vs 123.4 bu/acre last year. US soybean crop in 2013/14 at 3.269 billion bushels versus 3.015 billion in 2012/13. Yields 42.5 bu/acre vs 39.6 bu/acre last year. World wheat crop in 2013/14 at 694 MMT versus 639 MMT in 2012/13, ending stocks up to 179 MMT from 167 MMT. World corn crop in 2013/14 at a record 952 MMT versus 838 MMT in 2012/13, ending stocks up to 145 MMT from 111 MMT. World soybean crop in 2013/14 at 276 MMT versus 264 MMT in 2012/13, ending stocks up to 62 MMT from 56 MMT. Elsewhere, Japan bought 105,425MT of milling wheat overnight from the US, Canada, and Australia. Argentina's February soybean crush is reported at 1.2 MMT, the lowest monthly total in 11 years, presumably on lack of old crop beans. CBOT soybean prices have climbed to fresh three-week highs in overnight trade. 18/04/13 -- Rapemeal prices on the continent are sharply higher once more, extending an extraordinary run that's seen prices rise almost 40 euros on old crop May/Jul 13 since the beginning of the month. 18/04/13 -- The overnight market sees beans 6-7 cents higher on old crop and 2-3 cents firmer on new crop. Globex wheat is up 5-6 cents and corn flat to up 1 1/2 cents. London and Paris wheat are mixed, corn is lower and rapeseed is adding to yesterday's sharp gains, up around 3 euros. Reuters are reporting that the Brazilian dock workers strike lined up for today now isn't going ahead. Toepfer have estimated the German 2013 wheat crop at 22.87 MMT versus their figure of 22.3 MMT for last year. Estimates for this afternoon's weekly export sales report from the USDA are: Wheat 200-450 TMT; Corn 250-500 TMT; Beans 400-700 TMT; Meal 100-250 TMT; Bean oil 0-15 TMT. The KazTAG News Agency estimates grain production in Kazakhstan this year at "at least" 15.2 MMT. That would be more than 55% up on last year. Reuters report that Qatar is to buy USD3 billion worth of Egyptian government bonds, and that Libya is to extend Egypt a USD2 billion 5-year interest free loan. Whether that means that they will be back in the wheat market soon remains to be seen. UK retail sales fell 0.7% in March, with non-food sales down 4% - the largest monthly drop in at least 3 years - say the BBC. The pound is a bit weaker on the news. In China 17 people have now died from the bird flu, out of 82 reported cases. MDA CropCast have cut their 2013/14 world wheat production estimate to 676.2 MMT, down 8.4 MMT from last week due to acreage reductions and expected dryness in the US Plains. Their preliminary 2013/14 US corn production estimate is 13.302 billion bushels, down 122 million bushels from last week due to expected stress in western belt areas this summer. 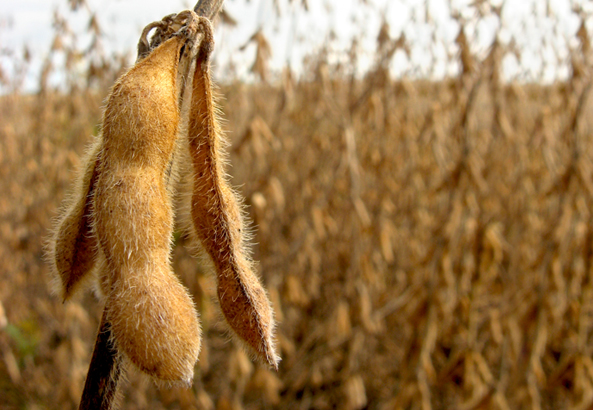 17/04/13 -- Soycomplex: The market managed to shrug off some of the continued negativity in outside markets and close higher, posting double digit gains in nearby May 13 beans. Abiove lowered their estimate for Brazil’s 2012/13 soybean crop from 82.3 MMT to 82.1 MMT, placing the harvest at 85% complete. They estimated Brazil’s 2012/13 soybean exports at 38.2 MMT versus a previous estimate of 38.5 MMT, and increased their 2012/13 ending stocks from 3.1 MMT to 3.4 MMT. Brazil dock workers are due to stage a one day strike tomorrow, causing further shipping delays. There's continued talk of China shopping for US soybeans out of the PNW due to Brazilian port congestion. Argentine truckers are also set to strike on April 22nd. Weekly soybean export sales for tomorrow are estimated at a combined 400-700 TMT for both crop years, old crop sales are already 99% of the USDA's projected 36.741 MMT for the season. Fund buying was estimated at 4-5,000 soybean contracts on the day. May 13 Soybeans closed at USD14.22 1/4, up 10 3/4 cents; Jul 13 Soybeans closed at USD13.80, up 4 3/4 cents; May 13 Soybean Meal closed at USD407.30, up USD6.00; May 13 Soybean Oil closed at 49.39, up 41 points. Corn: New crop corn got support from weather conditions in the Midwest looking like continuing to delay early planting hopes, and talk of some switching into soybeans. "Another hard freeze is predicted this week with a fresh cold outbreak. Lows in the mid-upper 20s F would develop Thursday morning on the High Plains and throughout hard red winter wheat Friday morning," say Martell Crop Projections. Nebraska is in for temperatures 25 F below normal as a fresh cold wave hits the state, they add. Not all the corn news is bullish though, Brazilian firm SOMAR said that they expect an "outstanding" 2nd corn crop due to ongoing rains keeping soil moisture levels high. Weekly US ethanol production fell to 832,000 barrels/day from 854,000 bpd last week and versus 884,000 bpd a year ago. Output needs to average around 840,000 bpd to meet the USDA's target for the season. Argentina have raised the biodiesel blend rate to 10% from 7% currently. The German Farm Coop DRV estimated the 2013 German corn crop at 4.32 MMT, down 21.4% from a year ago. Italy's Jan grain imports were up 21% to 911 MMT, with corn imports more than doubling to 404 TMT. Weekly corn export sales for tomorrow are forecast at 250-500 TMT. Fund buying was estimated at a net 3,000 corn contracts on the day. May 13 Corn closed at USD6.60 1/2, down 2 3/4 cents; Jul 13 Corn closed at USD6.41 1/4, up 1/2 cent. Wheat: A choppy session saw wheat move higher in early trade, only to give up those gains later in the session to close around unchanged. As with corn uncooperative US weather is supportive for new crop. Fargo in North Dakota hasn't reached 50 F on any day this calendar year so far, breaking a 131 year old record. As well as spring wheat planting delays, we also have worries about freeze damage to winter wheat in the US. "Kansas temperatures are set plummet to the low 20s F Friday morning and Oklahoma mid to upper 20s F. This would be similar to the April 10 freeze, only now it is a week later when crop development is more advanced," said Martell Crop Projections. Russia’s Grain Union estimated the 2013 Russian grain crop at 90-95 MMT versus a previous estimate of 90.0 MMT, they pegged the 2013/14 exportable surplus at 20.0 MMT, unchanged from their previous estimate. DRV cut their German all wheat forecast from 23.6 MMT to 23.2 MMT, although that's still up 8.4% on last year's 21.4 MMT. Toepfer suggested that the German wheat crop will be lower than that at 22.87 MMT. Jordan passed on their 100 TMT wheat tender once again, and immediately re-tendered for the same. Libya bought 50 TMT of Russian wheat. Tomorrow's weekly export sales for wheat are estimated at 200-450 TMT. Fund buying in CBOT wheat was estimated at 1,000 contracts on the day. May 13 CBOT Wheat closed at USD7.03 3/4, up 1/4 cent; May 13 KCBT Wheat closed at USD7.42, up 1/4 cent; May 13 MGEX Wheat closed at USD8.08 1/4, down 1 1/2 cents. 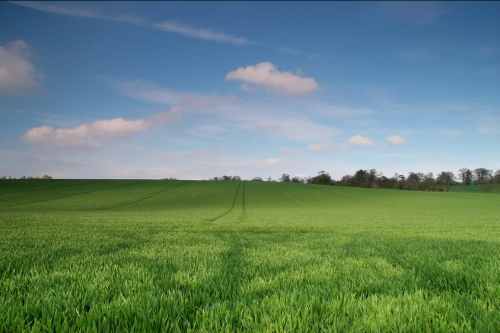 17/04/13 -- EU grains closed mostly firmer with London wheat supported by the pound slumping to a one month low against the euro on the back news that UK unemployment rose to 2.56 million at the end of February. Also undermining the pound was news that the Bank of England's MPC were split 6-3 again this month on whether or not to raise QE. 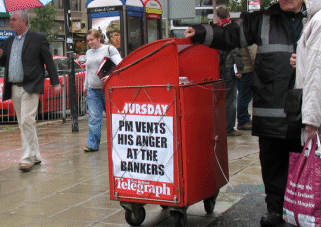 Once more, BoE Governor King wanted a GBP25 billion increase to try to stimulate Britain's fragile economy. On the day, May 13 London wheat closed up GBP0.25/tonne at GBP198.00/tonne and with new crop Nov 13 up GBP0.35/tonne to GBP186.30/tonne. May 13 Paris wheat settled EUR0.50/tonne higher at EUR246.75/tonne. The long awaited arrival of spring could prove to be a false dawn, for northern and western Europe at least. Highs in the mid-70's in northern France and Germany today will give way to daytime highs only in the mid-50's by the weekend. Meanwhile many of us in the UK could be waking up to a frost on Saturday morning, according to the BBC. The German Farm Co-operative Deutsche Raiffeisenverband, or DRV, today trimmed their forecast for grain production there from a previous estimate of 45.1 MMT to 44.4 MMT, saying that crop development was 2-4 weeks behind schedule. They did however say that there was still time for some of this lost ground to be made up, and that significant winterkill instances were only isolated. They cut their German all wheat forecast from 23.6 MMT to 23.2 MMT, although that's still up 8.4% on last year's 21.4 MMT, aided by plantings 3% higher. Winter and spring barley production combined was estimated down from 9.95 MMT previously to 9.75 MMT, a 6.25% fall on 2012 (planted area is seen down 6.1%). OSR output was forecast down from 5.39 MMT previously to 5.15 MMT, up 7.3% on last year thanks to a similar rise in acreage. 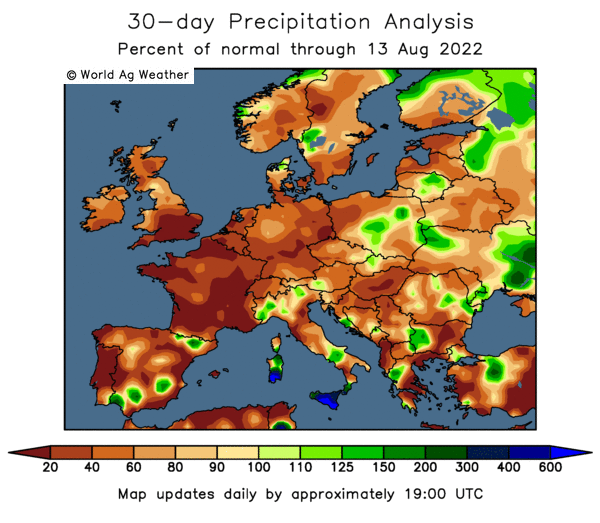 They say that German farmers have used the favourable weather conditions in recent days to step up their spring plantings and that they are hoping for "constant spring temperatures with adequate rainfall, so that the crops can be at least partially make up for the lagging growth again and fully develop the existing yield potential." Cash-strapped Egypt said that they have wheat reserves of 1.74 MMT on hand, which is enough to last them 71 days, with a further 120 TMT on the way. That takes supplies up to only 75 days of usage, whereas they would normally carry around 6 months worth. There are reports that they may strike some sort of deal with Russia to supply them new crop grain, but the details are sketchy. There's also been talk of Kazakhstan possibly extending Egypt some sort of credit facility to buy grain and a loan of sorts from Qatar. Spring planting is underway in Russia, with 1.45 million hectares in the ground already. That's 4.8% of the planned area, and ahead of last year's pace. The total spring planted area is estimated at 33 million ha. Dryness concerns in the south are starting to get a mention. The Russian government sold a further 55,907 MT of intervention grain at auction today, bringing the total volume sold so far since sales began to almost 2.9 MMT. The Russian PM said that the country could produce 90-95 MMT of grains this year given favourable weather, versus 71 MMT a year ago. 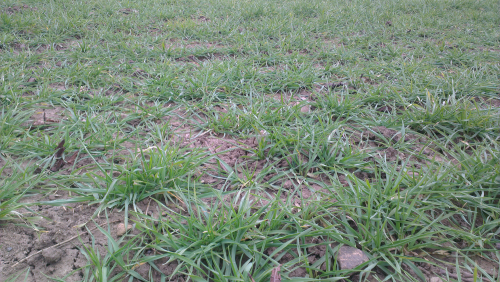 Ukraine's early spring plantings are also progressing well, now that the snow has melted, at 61% complete. Most of the 1.77 million hectares that has been planted so far is spring barley (1.49 million ha), with smaller areas of wheat, oats and peas. Around 5% of the planned sunseed area is also planted, with corn sowing yet to get underway. Morocco are tendering for 50 TMT of EU durum wheat. Bangladesh are tendering for 50 TMT of optional origin wheat and Jordan are in for 100 TMT each of optional origin wheat and barley. Early concerns over dryness in Australia ahead of planting of winter wheat are prompting some analysts to already question ABARES 2013/14 wheat production estimate of 24.9 MMT. Australia's 2012/13 wheat ending stocks are seen at only 3.0 MMT versus 8.0 MMT a year previously. Lower carry-in and reduced output in 2013/14 could see next season's wheat exports fall to around 14-15 MMT versus 19.0 MMT in 2012/13 and the 2011/12 record of 23.0 MMT, some are estimating. Large parts of the US remain unseasonably cold. "Very cold spring weather in the Eastern Midwest has given way to more seasonable temperatures, but west of the Mississippi River stubborn cold is hanging on. Really cold. In Nebraska, the US's 3rd biggest corn state, temperatures are expected to fall 25 F below normal as a fresh cold wave hits the state. Night-time temperatures in the low-mid 20s F would are predicted both tonight and Thursday night, freezing fields through a very deep layer," say Martell Crop Projections. 17/04/13 -- Having opened GBP2.00/tonne higher, May 13 London wheat is now only GBP0.25/tonne higher. New crop Nov 13 is also off the intra day high of GBP187/tonne to currently trade GBP0.20/tonne lower at GBP185.75/tonne. Paris and Globex wheat have also given up early gains to trade GBP1.25/tonne and 3 1/2 cents lower. The pound has fallen to a 1-month low against the euro on rising UK unemployment and news from the BOE minutes of a 6-3 split on whether or not to increase QE at this month's MPC meeting. Spring might not be here just yet, the BBC are forecasting a frost for Sunday morning's marathon runners to contend with. Whilst it's set to hit 79F in the south of France, and 72F in the north of the country today, the rest of the week is looking much cooler, with highs of only 50-52F on Friday. Egypt say they have 71 days worth of wheat reserves. They'd normally be carrying six month's worth. Russia say they've planted 1.45 million hectares of spring grains, around 5% of the planned area, which is ahead of last year's pace at this time. Morocco are tendering for 50 TMT of EU durum wheat. Japan have bought 38,665 MT of feed barley/wheat and are tendering for 105,425 MT of milling wheat. Jordan are in for 100 TMT each of wheat and barley, although they've passed on both several times lately. Italy's Jan grain imports were up 21% to 911 MMT, with corn imports more than doubling to 404 TMT. The FAO say that India will export 7.5 MMT of wheat in 2012/13 (Jul/Jun). They reportedly picked up a best bid of USD304/tonne in an overnight tender. There's talk of the government proposing to create 2 MMT worth of extra grain storage facilities. Wheat procurement in Punjab is underway, with government agencies and private millers buying around 360,000 MT so far from the 2013 harvest. Dryness in Australia is starting to get flagged, with one report this morning saying that soil moisture in areas of New South Wales was less than 30% of historical averages for the week ending April 7th. Meanwhile, Fargo in North Dakota has still not reached 50 F on any day this calendar year. Further south "Another hard freeze is predicted this week with a fresh cold outbreak. Lows in the mid-upper 20s F would develop Thursday morning on the High Plains and throughout hard red winter wheat Friday morning," say Martell Crop Projections. 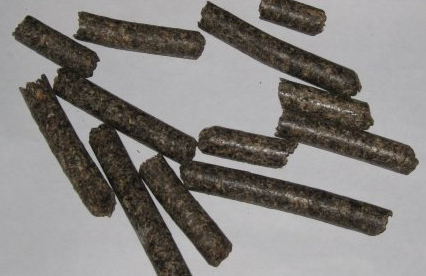 17/04/13 -- Got an odd load or two of Supaflow sugar beet pulp pellets available on resale if anyone wants any. Must be able to take delivery in April. Bought basis deld into the NW but may be able to switch to other locations and/or convert to Maxibeet. POA. First come, first served and all that stuff. Book now to avoid disappointment. You may look stupid, but you don't have to act it as well, etc. 17/04/13 -- Rapemeal prices on the continent are sharply higher again today, extending a remarkable run, with May 13 now up EUR27/tonne since the beginning of the month and new crop Nov13/Apr14 EUR16/tonne in the same period. 16/04/13 -- Soycomplex: A sense of calm in outside markets allowed the market to recover yesterday's losses. Oil World estimated Feb-April Chinese bean imports at 10.3 MMT down 25% from a year ago. They also pegged the South American soybean crop at 143.6 MMT versus the USDA's 148.75 MMT. They estimated the Brazilian crop at 81.3 MMT, unchanged from their previous estimate and versus the USDA estimate of 83.5 MMT. They have the Argentine bean crop at 48.5 MMT, also unchanged from their previous estimate and lower than the USDA's 51.5 MMT. Michael Cordonnier has the Brazilian bean crop at 81.5 MMT and the Argentine crop at 50.0 MMT, both are unchanged from his previous estimates. Fund buying was estimated at 6-7,000 soybean contracts on the day. May 13 Soybeans closed at USD14.11 1/2, up 16 1/2 cents; Jul 13 Soybeans closed at USD13.75 1/4, up 19 1/4 cents; May 13 Soybean Meal closed at USD401.30, up USD8.00; May 13 Soybean Oil closed at 48.98, up 80 points. Corn: The corn market also gained as the capitulation of outside markets waned. Last night's news that US corn planting was only 2% complete as of Sunday night was supportive. Michael Cordonnier said that the USDA's US corn planting area estimate of 97.3 million acres was too high. He estimated non-planted US corn acres at 1-3 million due to spring planting delays, and said that in worst case scenario this could rise to 5-6 million, but emphasised that it was still too early for too much concern. He estimated the Brazilian corn crop at 75.0 MMT, up 1.0 MMT from previous his previous forecast. The Argentine corn crop was pegged at 24.0 MMT, unchanged from his previous estimate. He said that about 30% of the Argentine corn crop has been harvested. Weekly ethanol production data will be out tomorrow. Last week’s 854,000 barrels/day grind was the largest weekly total since June 2012. The bulls will be hoping for that run to continue. Funds were seen as net buyers of around 10-12,000 corn contracts on the day. May 13 Corn closed at USD6.63 1/4, up 16 1/2 cents; Jul 13 Corn closed at USD6.40 3/4, up 12 3/4 cents. Wheat: Russia’s grain lobby said that they may loan Egypt money to buy grain from Russia. Russia sold 59,191 MT of intervention grain at their now regular twice weekly auction. That brings the total sold since sales began in October to 2.823 MMT. SovEcon said that Russian winter grain crop conditions had declined. Using a new rating system, with 100 being "normal" over recent years, they said that conditions fell from 96.4 last week to 95.1 this week. Commerzbank also said that Russia wheat quality is worse than expected. Russia’s grain ending stocks are estimated at 2 MMT and the grain lobby said that the government should keep these until the 2013 harvest. Bangladesh are tendering for 50 TMT of optional origin wheat for April/May shipment, India is the favourite to win that. Jordan are also back in the market for 100 TMT each of optional origin wheat and barley. Fund buying in CBOT wheat was estimated at 2-3,000 lots on the day. May 13 CBOT Wheat closed at USD7.03 1/2, up 9 3/4 cents; May 13 KCBT Wheat closed at USD7.41 3/4, up 9 1/4 cents; May 13 MGEX Wheat closed at USD8.09 3/4, up 11 3/4 cents. 16/04/13 -- EU grains closed mostly firmer, with a weaker pound/stronger euro saw London wheat fare better than Paris wheat on the day. London wheat closed with front month May 13 up GBP3.15/tonne to GBP197.95/tonne and new crop Nov 13 up GBP1.85/tonne at GBP185.95/tonne. May 13 Paris wheat closed EUR0.25/tonne firmer at EUR246.25/tonne. At home, Carr's CEO told Agrimoney that he expects the UK wheat crop to fall to around 11.0 MMT this year, which would be a 17% drop on last season's disaster, and the lowest production in 30 years. Certainly that would see the UK feature as a major wheat importer again in 2013/14, although it doesn't necessarily mean that GBP200/tonne plus for new crop is assured. The cost of wheat, and corn, imports from abroad will decide that. 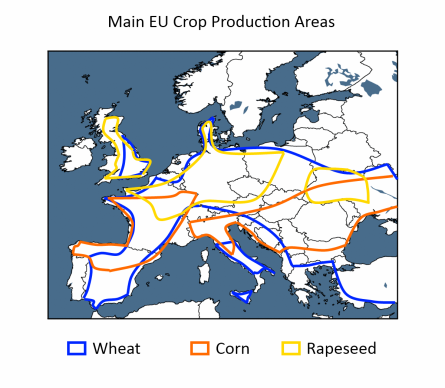 Ukraine, potentially one of the UK's leading suppliers, says that early spring grain plantings there are 50% complete at 1.46 million hectares, including 1.2 million of barley. The Ministry there say that the country's grain stocks at the start of the month stood at 18.0 MMT, versus a domestic usage requirement in the last quarter of 2012/13 of 7.4 MMT. With ending stocks projected at 5.5 MMT, that leaves them a further 5.1 MMT to comfortably export between now and the end of the season. With grain exports this season so far standing at 20.2 MMT, they could therefore end up shipping in excess of 25 MMT in 2012/13, versus the current Ministry estimate of 24.6 MMT. Meanwhile winter grains there are rated 92% good/excellent. UkrAgroConsult last week estimated wheat production in Ukraine at 20.23 MMT, up 28% on last year. Corn output is forecast at 21.8 MMT versus 20.92 MMT in 2012/13, making them aggressive likely exporters of both grains again in 2013/14. Russian grain production is set to rebound this season, although opinions vary on by how much. The lowest estimate in the ring at the moment is 85 MMT and the highest 92 MMT. Even the lowest figure represents an increase of 20% on last season, with the upper figure nudging at 30%. The government will be looking to replenish their low intervention stocks next season for sure, although the levels at which they have indicated that the would wish to enter the market are still significantly lower than current prices. Egypt meanwhile remain absent from the international tender market, saying that they've made progress with the IMF in their loan request, but that no deal has been done yet. The size of their 2013 wheat crop is shrouded in mystery despite that fact that harvesting of it should begin this month. The government say that they will harvest a record 9.5 MMT of wheat this year, based on a highest ever winter wheat planted area of 1.43 million hectares. Many analysts however say that this estimate is wildly optimistic given fertiliser and diesel shortages and that 6-7 MMT may be nearer the mark. A return to more like seasonally normal temperatures in France in recent days should see a significant improvement in crop conditions and spring corn planting progress there in Friday's weekly report. German wheat is estimated to be 2-4 weeks behind normal growth, but should also benefit from much warmer temperatures this week. US spring wheat plantings are only 6% done versus 13% normally. Winter wheat crop ratings held steady at 36% in the good/excellent category last night, contrary to trade expectations of a drop due to last week's hard freeze. 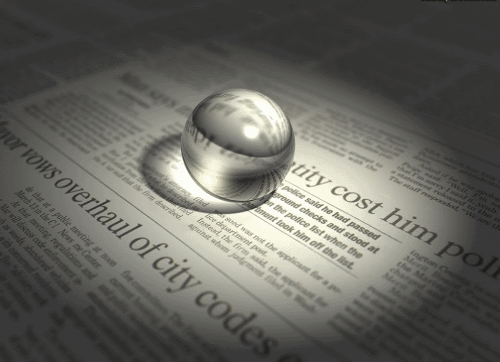 Maybe the effects of that will show up on next week's report? On the other hand, maybe the fact that the crop is showing retarded development versus normal actually kept damage to a minimum. 16/04/13 -- Rapemeal prices on the continent are a little firmer again on old crop, and slightly weaker on new crop. The unexpected prolonging of the winter feeding season, and reduced crusher output due to depressed margins, is keeping nearby availability tight. 15/04/13 -- Soycomplex: Outside market weakness dragged the entire grains complex lower, with gold posting its largest 2-day loss on record and crude oil also falling heavily. Weekly soybean export inspections were poor at 4.813 million bushels versus the expected 12-17 million. In China, bird flu now has 63 human cases reported with 14 human deaths. A Bloomberg survey estimated 2013 Chinese soybean imports may fall to 58.0 MMT due to bird flu. The March NOPA crush came in at 137.08 million bushels, versus 136.3 million in Feb and trade estimates of 136.8-140.0 million. Safras e Mercado said that the Brazilian soybean harvest is 82% complete versus 76% a week ago, 85% a year ago and the 5 year average of 78%. Trade estimates have the funds down as net sellers of around 7-10,000 soybean contracts on the day. May 13 Soybeans closed at USD13.95, down 18 cents; Jul 13 Soybeans closed at USD13.56, down 23 1/4 cents; May 13 Soybean Meal closed at USD393.30, down USD6.90; May 13 Soybean Oil closed at 48.18, down 105 points. Corn: Outside influences also had corn under pressure, closing close to session lows. Weekly export inspections of 14.701 million bushels were in line with the expected 10-16 million, but still lag the pace needed to hit USDA targets for the season. The Chinese Stats Bureau said that corn plantings there are expected to rise 4.1% this year. Some had been saying that heavy snow in northern corn areas might cause a shift in plantings to beans, they clearly don't see it that way forecasting the bean area down 8.5%. "Harbin, the capital of Heilongjiang, averaged 35-36 F last week, abnormal cold is expected to persist another 3-4 days before temperatures gradually moderate," say Martell Crop Projections. Argentina's Ag Ministry say that corn harvesting there is 36% compete versus 34% a year ago. After the close the USDA said that corn planting in the US is only 2% complete as of Sunday night, compared to 16% last year and the 5-year average of 7%. Illinois has only 1% planted whilst in Indiana and Iowa there's nothing at all in the ground yet. The NOAA said that US March temperatures were the coldest in 11 years, restricting fieldwork. Fund selling was estimated at a net 10-15,000 corn contracts on the day. May 13 Corn closed at USD6.46 3/4, down 11 3/4 cents; Jul 13 Corn closed at USD6.28, down 13 1/4 cents. Wheat: With corn and soybeans succumbing to weakness in outside markets, it's perhaps of no surprise that wheat wasn't strong enough to resist the downwards pull either, despite the USDA reporting 480 TMT of US SRW wheat sold to China for 2013/14 as part of last week's widely rumoured business. China are also said to have booked 400 TMT of Australia wheat for June shipment in the past few weeks. Trade analysts suggest that China will buy 3-5 MMT of wheat from Canada, Australia and the US for June–Dec shipment. The Buenos Aires Cereals Exchange estimated Argentina’s 2013/14 wheat area at 3.9 million ha versus 3.6 million a year ago, but still down 7% from the 5-year average. Russia’s Ag Ministry said Russia exported 14.2 MMT of grain between July 1 – April 10th, down 36.8% from a year ago, and that full season exports may only be 14.8 MMT. After the close the USDA reported US winter wheat crop conditions at 36% good to excellent, unchanged from a week ago but well down on 64% a year ago. Poor/very poor was up one point to 31% and versus 11% a year ago. Weekly export inspections were 23.476 million bushels. Fund selling was estimated at 5-6,000 in Chicago wheat. May 13 CBOT Wheat closed at USD6.93 3/4, down 21 cents; May 13 KCBT Wheat closed at USD7.32 1/2, down 20 1/2 cents; May 13 MGEX Wheat closed at USD7.98, down 9 3/4 cents. 15/04/13 -– The EU grains traders market closed lower, as fund money continues to pull out of the sector, and commodities in general. Both crude oil and gold were also down heavily, with the latter slumping to a 2-year low marking the worst 2 day drop for gold in 30 years. The last time gold fell over 10% in 2 days was Feb 1983. Worse than expected Chinese GDP data is one of the reasons being cited as being behind today's push lower. Bird flu, Cyprus and North Korea are amongst others. London wheat closed with front month May 13 down GBP3.15/tonne at GBP194.60/tonne and new crop Nov 13 GBP3.05/tonne easier at GBP184.10/tonne. May 13 Paris wheat finished EUR3.50/tonne lower at EUR246.00/tonne. China reported Q1 2013 GDP at 7.7%, down from 7.9% in the final quarter of last year and below market forecasts. Data from the US shows fund money has spooked and slashed it's corn length by almost three quarters in the past fortnight, from 192,500 heading into the USDA's quarterly stocks report at the end of March, to less than 51.000 lots as of last Tuesday night, post the April WASDE report. Their overall net length in US agri commodities is now the smallest since at least 2006, say Agrimoney. 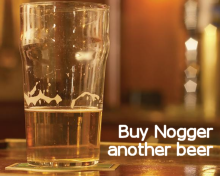 Faced with a mass exodus of that magnitude the futures market can only go one way. The USDA today confirmed private exporters had sold 480 TMT of US SRW wheat to China, to add to the 360 TMT that was reported last week. This now gets us up the the kind of number that the Chinese were widely rumoured to have bought around a week ago. The question now is will there be any more to add to that? The USDA will report after the close tonight on US winter wheat crop conditions and corn planting progress. Last week's report had 36% of the US winter wheat crop in good/excellent condition, up from 34% a week previously. However, the proportion of the crop rated very poor also increased from 10% to 12% last week. It will be interesting to see if last week's hard freeze is reflected in any way. Ukraine said that they'd exported 20.2 MMT of grains so far this season, a 22% increase on last year, including 11.4 MMT of corn and 6.6 MMT of wheat. APK-Inform Agency said that spring grain production in Ukraine will total 32.1 MMT as average yields rise 13% from 3.45 MT/ha to 3.91 MT/ha. Beneficial winter rains will see Turkey's wheat crop rise 13.5% to 17.6 MMT this year. That means 2013/14 imports will fall from 3.7 MMT this season to 3.2 MMT in 2013/13, according to the USDA's FAS. The United Arab Emirates purchased 15,000 MT of Indian-origin wheat in a tender, according to Reuters. Bangladesh are tendering for wheat again this week, and are also probably most likely to buy Indian origin. Jordan are re-tendering again for 100 TMT of optional origin wheat, although they've baulked at the prices offered in their last three tenders. As well as focusing on developing winter wheat crops in Europe and the US, the market is also starting to think about wheat planting in Australia. "New South Wales, Victoria and South Australia have received no important rainfall in April, the normal start of the winter wheat planting season. Persistent dryness may be linked to an emerging El Nino signal. Sea surface temperatures have been steadily warming in the eastern equatorial Pacific Ocean over the past several weeks. New South Wales, a top wheat state that grows around one-third of Australia’s crop, is especially sensitive to the El Nino experiencing drought," say Martell Crop Projections. 15/04/13 -- Friday's Commitment of Traders Report from the CFTC shows fund money continuing to desert the grains sector for the week through to last Tuesday night. Their corn long, which more than halved from around 192,500 lots to little more than 98,000 lots last week, nigh on halved again to a net long of just under 51,000. They decreased their soybean long by 14,615 contracts, and added a further near 13,000 worth of CBOT wheat shorts. Soybeans and soybean meal net-longs reached the lowest level in a year. Their overall net length in agri commodities is now the smallest since at least 2006, say Agrimoney. 15/04/13 -- Rapemeal prices on the continent continue to firm, with gains of between EUR2-5/tonne today. Crop development in the UK remains well behind normal. Take a look at this picture posted on Twitter with one farmer's field of rapeseed this morning on the right and the same field this time last year on the left. Link.